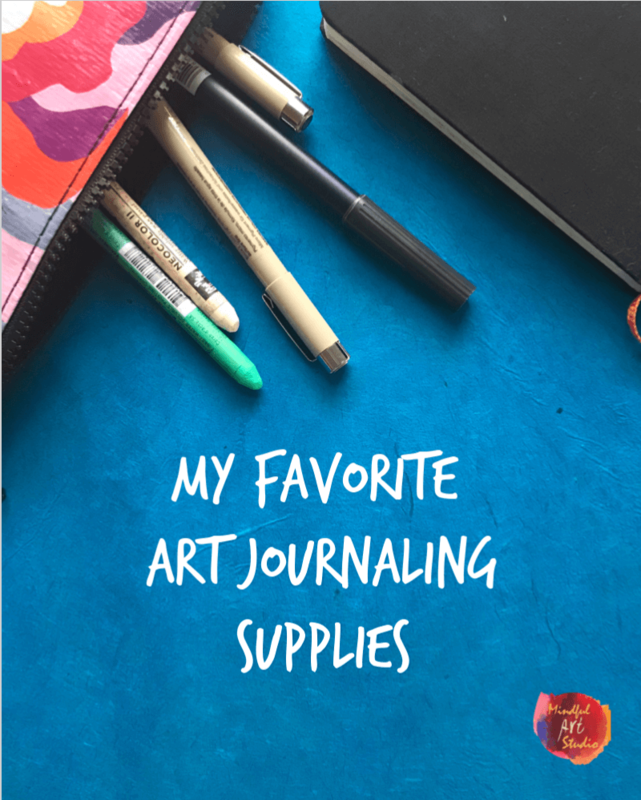 For this year’s holiday gift guide for artists, I thought that rather than just offering a list of all my favorite art supplies, I’d offer a mix of cherished supplies and fun artsy items that will help inject more creativity into your world. With 11 gifts under $50, it’s a great list to share with anyone wondering what to get you this holiday season. Speaking of which, if any of my friends and family are looking or some gift ideas for me for Christmas, this would be a great place to start! Artsy Pouches $9 – I use these babies to carry art supplies, mini masterpieces, small treasures I collect outdoors, and even my makeup. I’ve used these pouches for years. They are colorful, strong, and stand up to any abuse I’ve given them without looking worn or dirty. 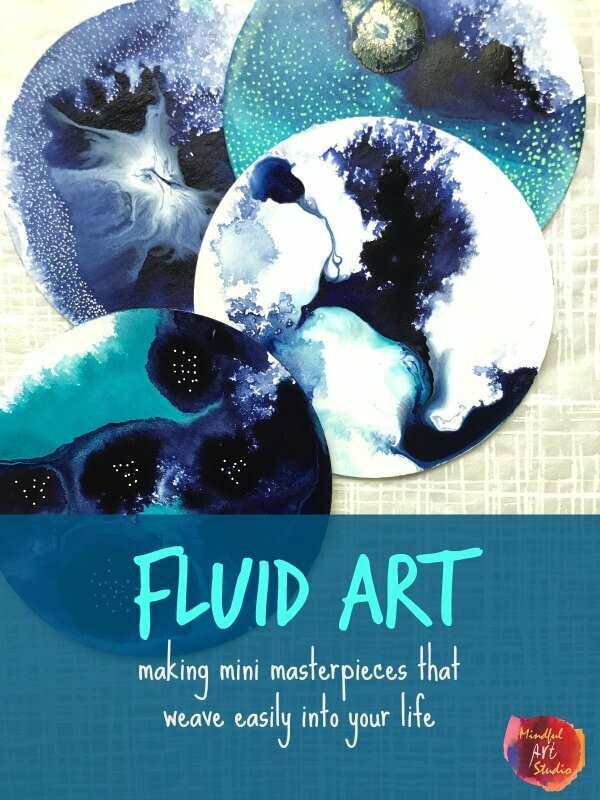 High Flow Acrylic Paint Set $33 – I can’t say enough about how fascinating these paints are. Just wet your page, drop some paint on it, and watch the magic happen. It’s like fool-proof art. It helps me to slow down too. I love to sit and observe how the paints move. Strathmore Mixed Media Board $13 – After working small for so long, I’ve been exploring working on some larger pieces in fluid paint for a while. These 8 x 10 boards make me feel like a kid rolling down the hill – I’m free! They still buckle a bit if I really load them up with giant puddles of paint and water, but I find they flatten out when they dry and I can press them flat between books once dry as well. Posca Paint Pens $25 – These are a new discovery for me in the last few months and I’M IN LOVE. The extra fine point is tiny enough to do quite a bit of the dot work I do on my teeny paintings, but bold enough for the larger work too. The paint is permanent, opaque, and looks so good I could eat it. 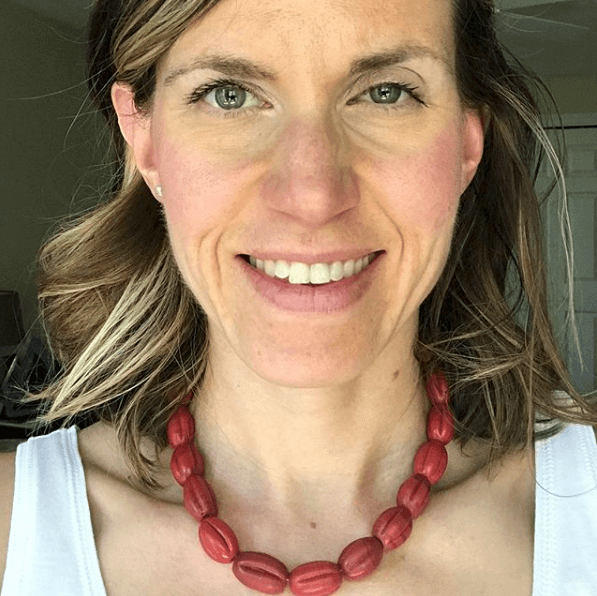 Your Inner Critic is Being a Jerk $12 – Danielle Krysa is the artist and creator of the wildly popular blog, The Jealous Curator. 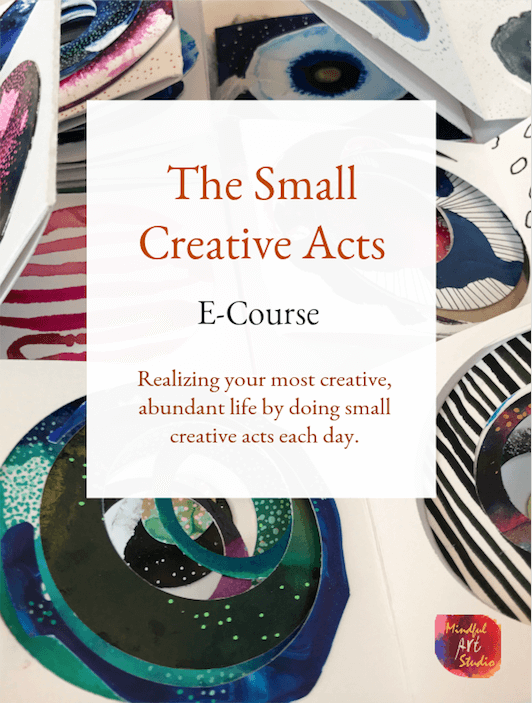 Danielle will help you put a stop to the negative self-talk and start making stuff. Now. Artsy Coffee Mug $30 – I’m lusting after this gorgeous hand thrown coffee mug, it would be beautiful on my art table. Isn’t it fun seeing your art and someone else’s mix together in your space? I love that. Hangry Socks $11 – I need. These socks. Right now. And also, do they make a “rungry” version of these too? I’m ridiculous if I don’t eat after I run. I get so rungry I might eat these hangry socks. Paper Source Notecards and Envelopes $10 – I love the A6 size in the Peacock color right now. I glue a mini masterpiece, add a few dots with my Posca pen, and it’s a gorgeous, handmade card. People always feel extra special when I give them a handmade card with my art on it. Viktoria Astrom Shop on Etsy $43 – This print, “Wolverine” is so beautiful, like all of Viktoria’s work. I love how she manages to blend whimsy and soul in her work. 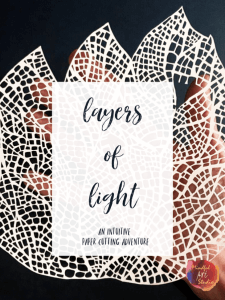 This would make a beautiful print for your art space, living room, or child’s room. A Glorious Freedom $11 – I’m a big fan of artist and illustrator Lisa Congdon. This is another inspiring and beautifully illustrated book, with a series of interviews with amazing women over 40 who have come into their own not in the height of their youth, but with age. We are like fine wine, ladies! 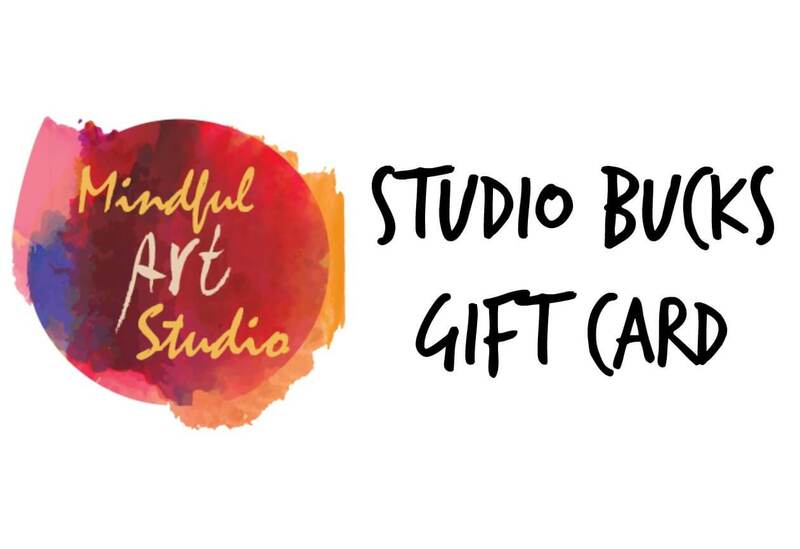 Mindful Art Studio Gift Cards, starting at $19 – If you have blossomed creatively because of a Mindful Art Studio class, why not offer the same to someone you love? I think giving an experience is a wonderful way to simplify and focus on what really matters at the holidays. * Some of the links in this post are affiliate links. 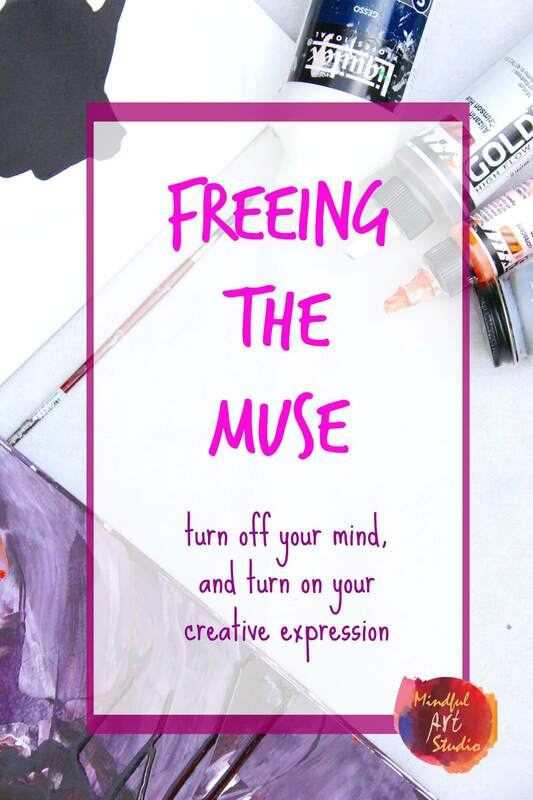 That means that if you choose to click and purchase something, at no extra cost to you, you will help support the work of Mindful Art Studio to empower the artist in us all. 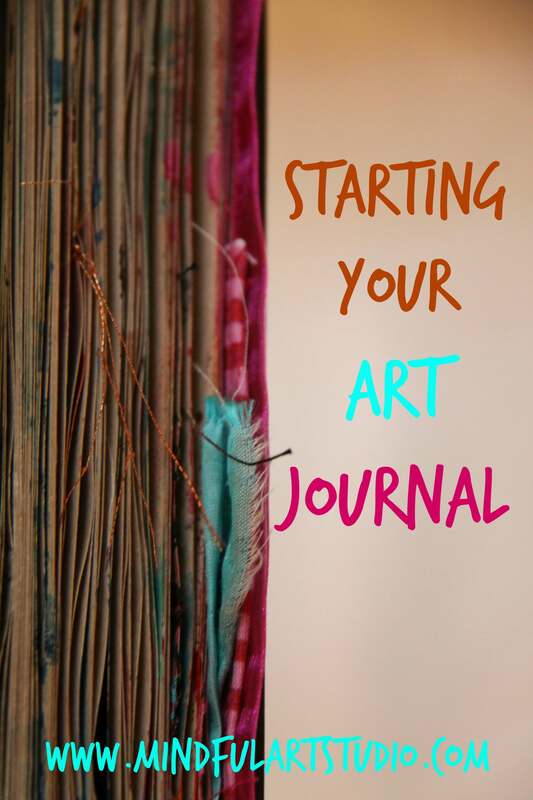 Having a portable art kit is one of the keys to weaving more art into your life. 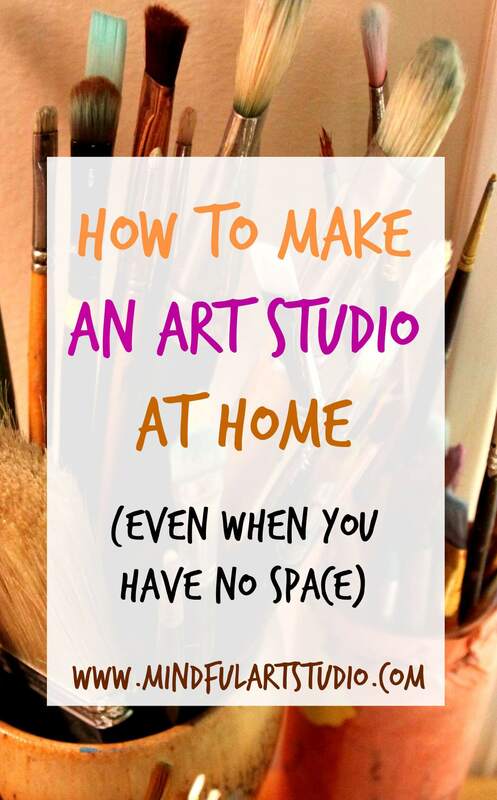 When you have a tiny art studio you can take with you, the art process is always ongoing. 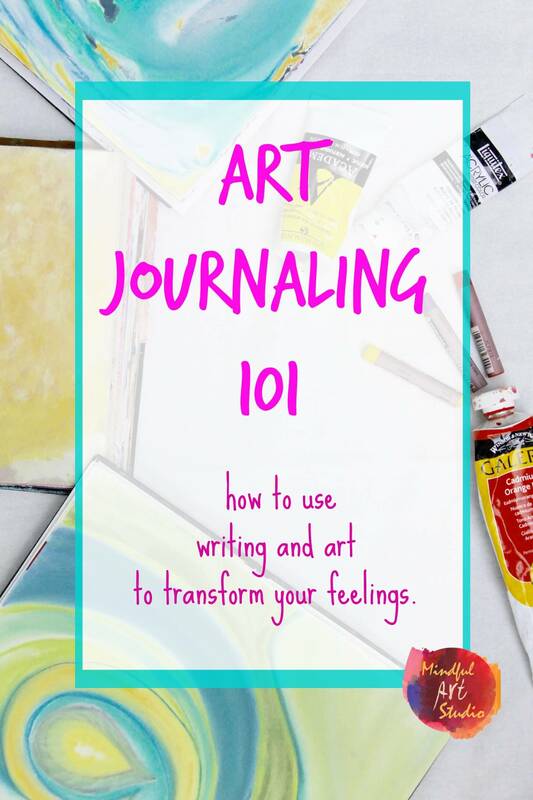 All you need is a small journal, some paint, a few pens, and maybe one or two collage items and you are ready. 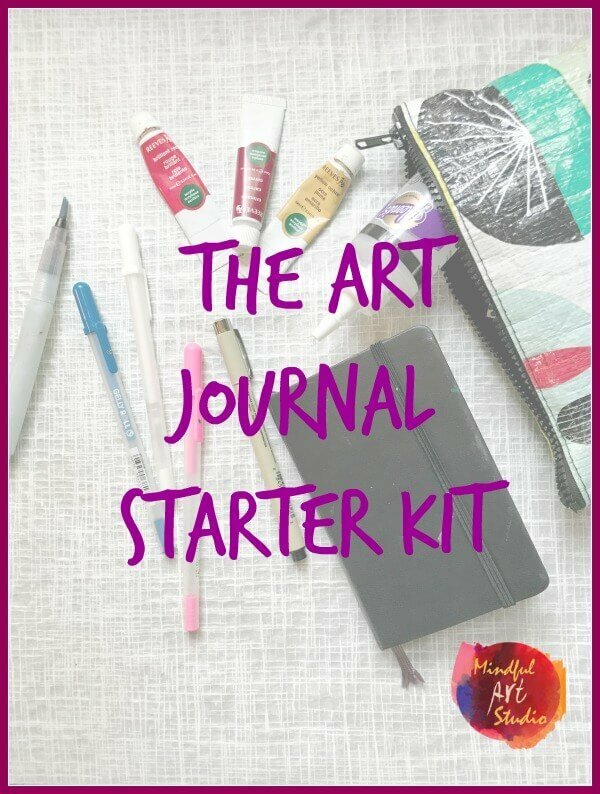 I’d like to help you put together your art journal starter kit if you haven’t already. I really treasure “stolen art moments.” On a day I’m feeling stressed, even 10 minutes of art and creative self-care makes my day more special and meaningful. 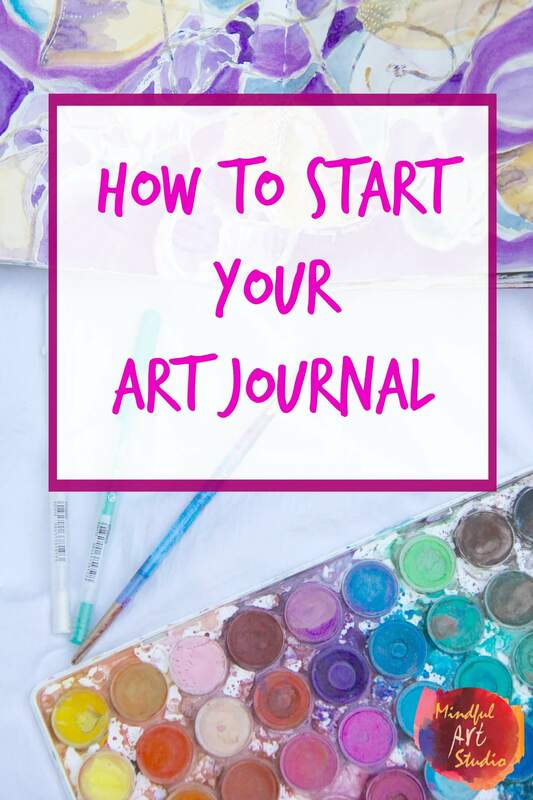 Like this morning, I was “supposed to” start this blog post, but one of my journal spreads was staring back at me, begging me to add some details. As I drew, I could feel my shoulders drop, and my mind relax. Ten minutes later I was ready to write. Sometimes, though, I’ll go outside and get a real change of scenery, like in this picture. Sometimes I draw during my lunch break, or take my portable art kit along with me on a hike. When I’m outside I feel I can breathe again, and it really stimulates my creativity. Sometimes people tell me that they feel too shy to draw in public, but I always think, what would my 90 year-old self tell me to do? Would she say my art is not “good enough” to make art in public? Or would she tell me to indulge all of my artistic whims while I can? Would she urge me to revel in every paint stroke? Every drawing? Would she instruct me to listen less to the critic and more to the muse? I listen to my old lady self, and create wherever the heck I want. What are we waiting for, anyway? Somebody might not like your art. So what? They also might not like your shirt, either. That’s their problem, not yours. This is more clever excuse-making by the critic. 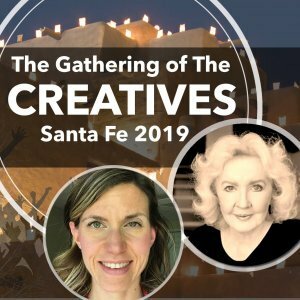 Let’s throw caution to the wind and be the wild, creative women our elder selves will wish we had been. 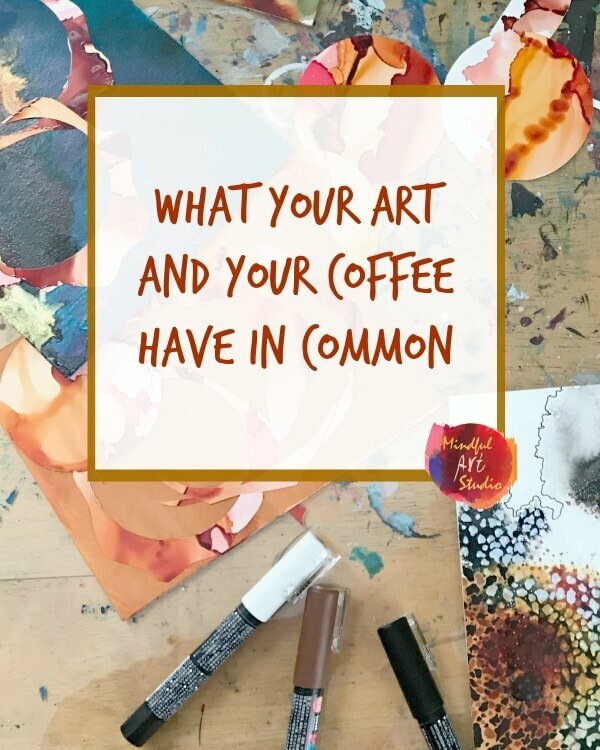 The local coffee house – This is a wonderful artist’s date: A coffee, baked good, and my journal – heaven! What am I missing? Where do you take yours? Moleskine accordion fold journal – Moleskine journals are very high quality. 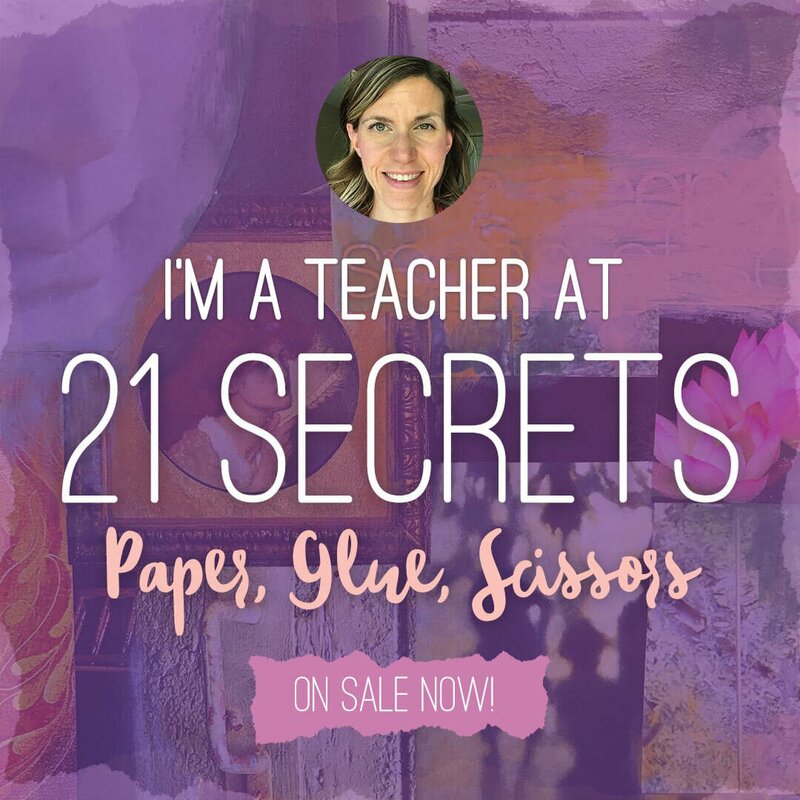 These pages are tough and stand up to anything I’ve done to them – cutting, painting, sewing, you name it. Micron pens – Microns don’t pool and they write smoothly. They are my favorite black pen. Sakura Gelly Roll pens – If you haven’t realized my obsession with gel pens by now, you will! I love making dots and repetitive shapes on my paintings with these colorful pens. Mini acrylic set – These tiny paint tubes are ideal for a portable art kit. 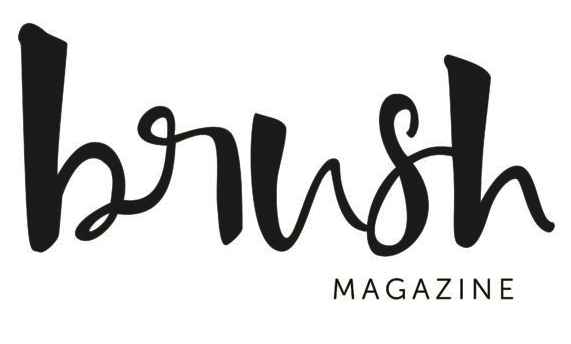 Koi water brush – Having the water in the brush is genius. 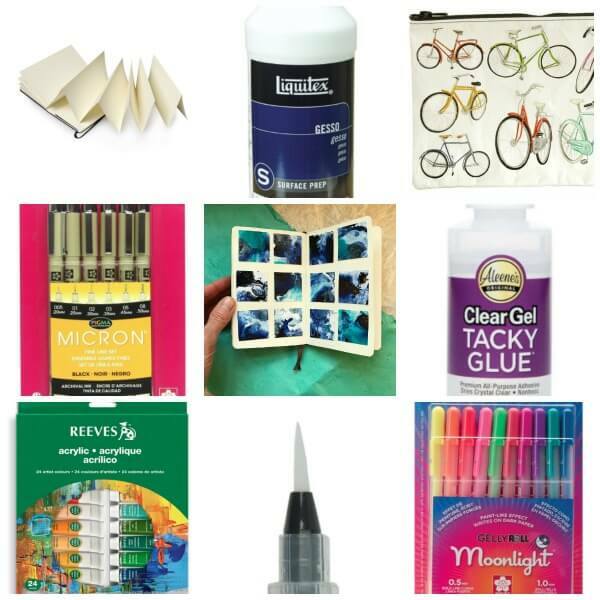 Glue – When I’m on the go, I like this craft glue, it dries fast and holds well. Blue Q plastic zipper pouch – I use these pouches for my art kits and my makeup, and I buy them for others every chance I get. Cut up bits of old art pieces – See how I’ve cut them in the center picture above? Isn’t that fun? You’ll be amazed at how much “good” work is hiding in the art you thought you did not care for. Optional: Small gesso tube to create smoky look with the watercolors or help acrylic pages to not stick together by using it as white. This bottle is pretty heavy, so if you are toting it around, I’d suggest buying a small travel shampoo tube and putting some in there. 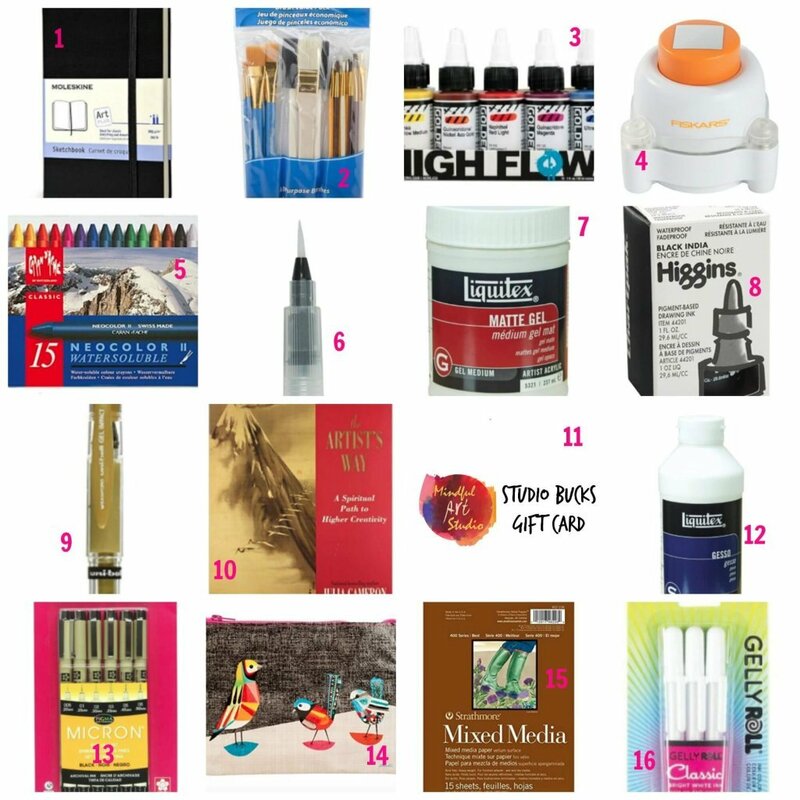 What’s in your portable art kit? Tell us about it. 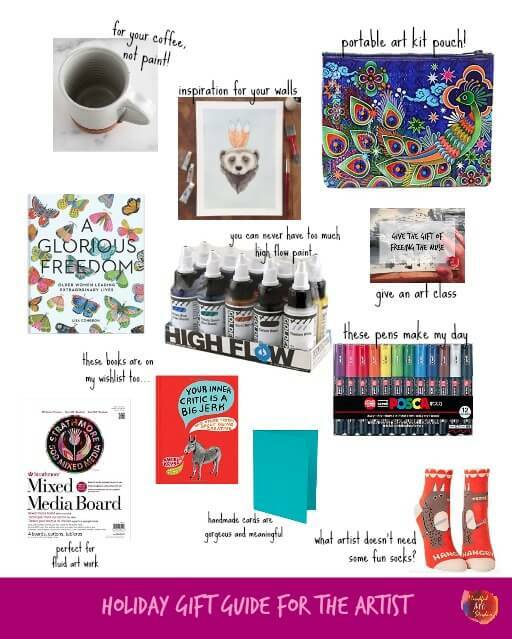 Also, would an Art Journal Starter Kit be the perfect gift for your mom, dad, or grad? 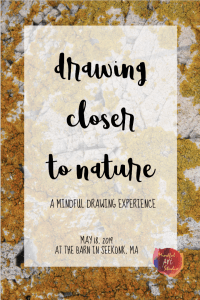 What about a Mindful Art Studio gift certificate? *Some of the links in this post are affiliate links. 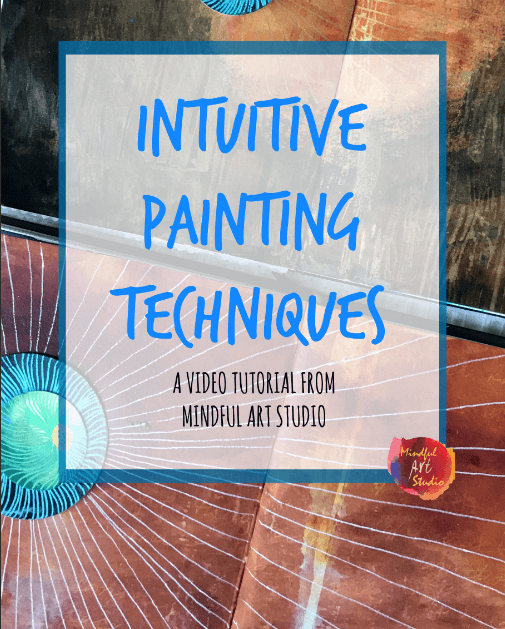 This means that at no extra cost to you, if you choose to click and purchase something, you’ll be supporting the work of Mindful Art Studio to empower the artist in everyone. 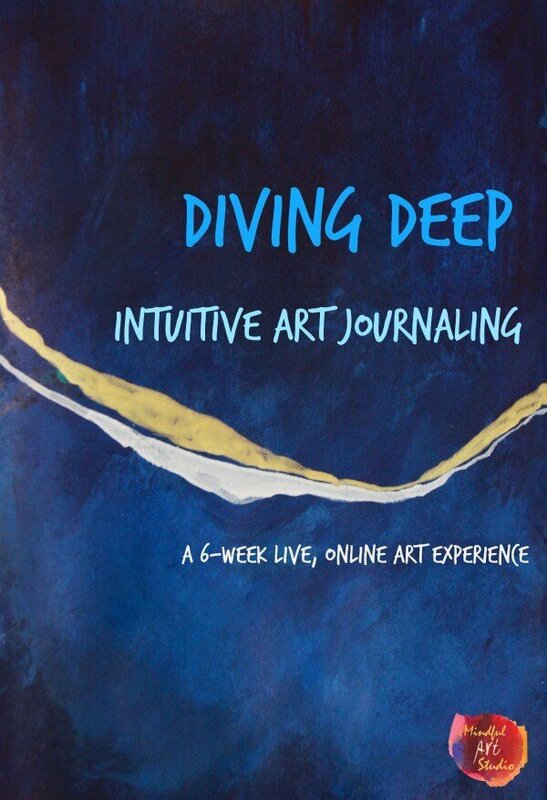 I frequently get questions about what to give creative people and art journalists. 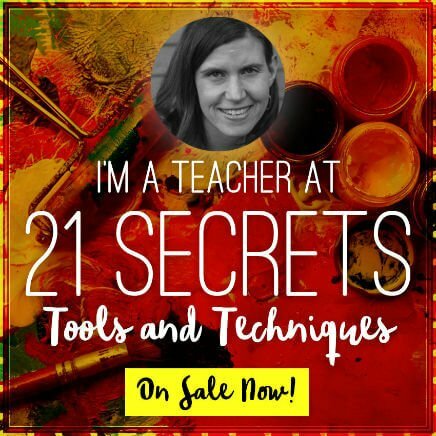 Most artists I know get pretty darn excited about supplies, and I like to make it easy for their loved ones to wow them with inspiring goodies in a little holiday gift guide. 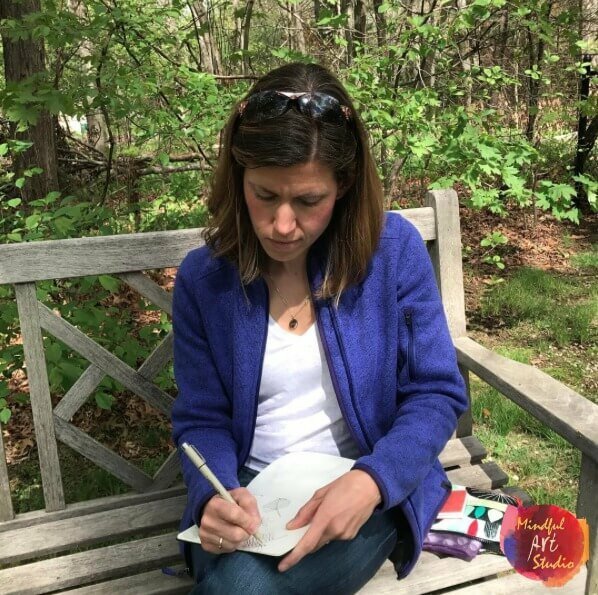 If you aren’t sure you feel comfortable giving a wish list of supplies, let me tell you my rationale about why I share mine. I’m a big fan of letting folks know what I want. I love surprises to be sure, but I also really appreciate the holidays as a chance to let others take care of me a bit, just as I do for them. 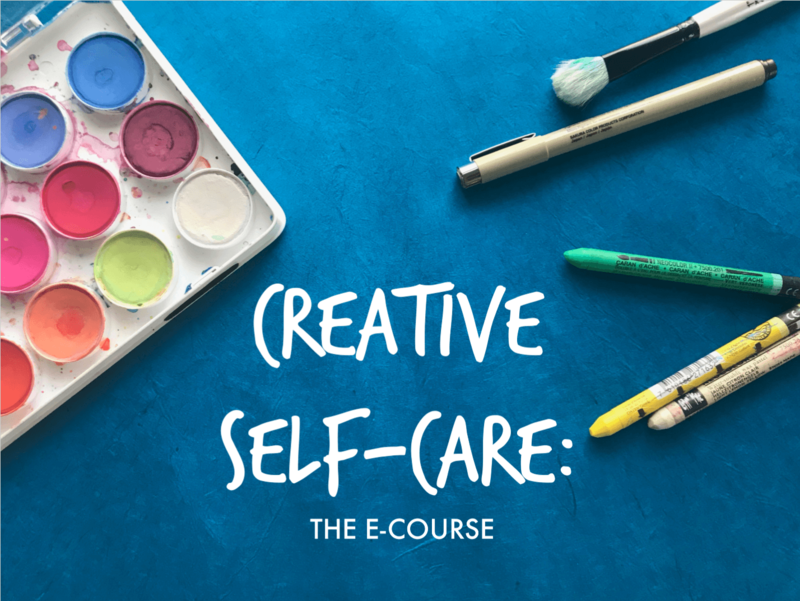 Who wouldn’t like a little creative self-care when it’s cold outside? It’s a great time to let folks know that, hey, I’m really wishing I could buy those new watercolors, or, I’d like to take that class, but haven’t had the means to treat myself. 1. Moleskine Art Plus Pocket Sketchbook 3.5 x 5.5 These pocket sized notebooks are great because their pages are thick enough to take some paint, but it’s a light little notebook that fits easily in my purse. 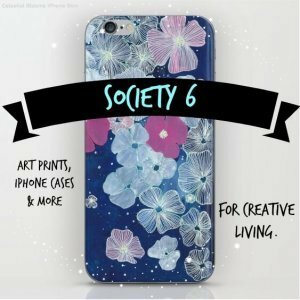 Art on the go! 2. Loew Cornell Brush Set I have high quality acrylic brushes that I use on canvas, but for the work I’m doing in journals, where I’m scratching the page doing messy backgrounds, switching between paint and gel medium, these brushes do the job nicely. 3. Golden High Flow Liquid Acrylics I have been having a love affair with these paints over the last year or so. 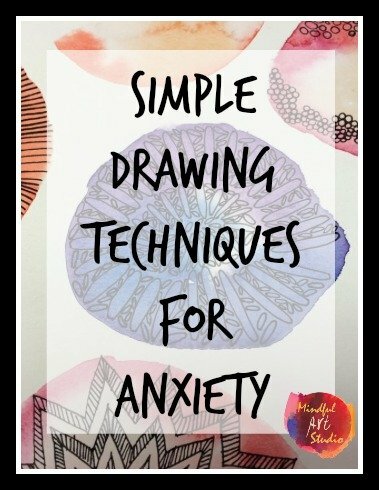 They do such amazing little tricks and help me get into the FLOW and get creative! 4. EK Tools Circle Punch 1.5 Inch As a part of my focus on working small this year, I’ve been punching tiny circles and squares out of mixed media paper and working on those. Talk about portable art! It’s very satisfying to work on a one or two inch square. You can cover a lot of ground in little time. 5. C’aran d’Ache Neocolor Water-Soluble Pastels I’ve been making simple patterns and backgrounds with these crayons. You can see some samples on my Instagram feed. 6. Koi Watercolor Brush This brush is always in my portable art pouch. It’s a brush that holds its own reservoir of water = AH-MAY-ZING! 7. Liquitex Matte Gel Medium While gel medium was initially created for thickening paint, it’s proven to be an excellent adhesive for paper, string, and cloth in mixed media art. Apply it with a brush and stick down those beautiful collage pieces. To see how this works, watch this video on adding imaginative illustrations to your pages. 8. Higgins India Ink If you’ve taken my classes, you know I’m a huge fan of ink and all the playful possibilities it offers on the page. The simplicity and contrast of black and white is BOLD. 9. Sanford Uniball Gold Gel Pen A gold pen – who wouldn’t love that for adding fun details and lettering? 10. 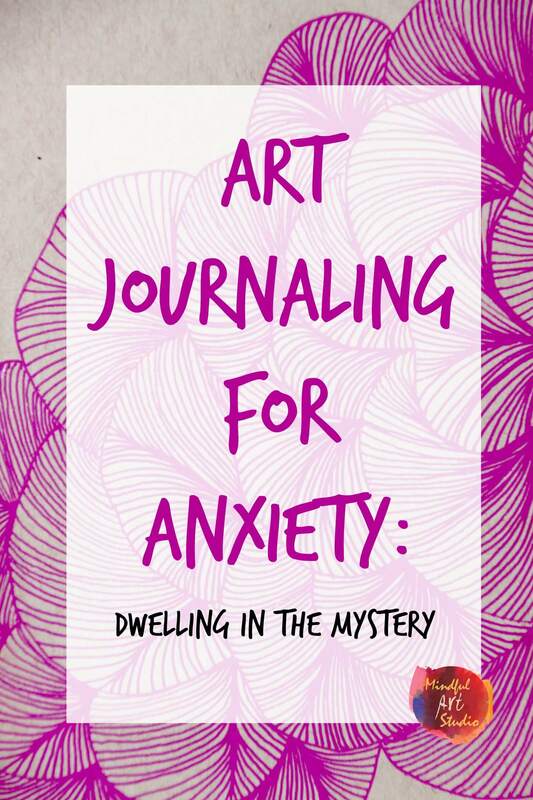 The Artist’s Way I can never say enough about how much this book changed my life and helped me recognize the artist within and what she needed. This is a must-read. 12. Liquitex Gesso Gesso has a lot of jobs in my journal. I use it to smudge and blend Neocolor crayons and watercolor paint. I also use it in place of white paint as this helps prevent the pages from sticking together. 13. Micron Pens Whether you are doing lettering or drawing on the page or over paint, these are quality, permanent markers that will not bleed and are archival quality. 14. Blue Q Pretty Bird Zipper Pouch A portable art pouch is empowering. Art is available any time. In the car. Out to dinner. In the doctor’s waiting room. On the plane. It’s about carving out time for art. 15. Strathmore Mixed Media Paper When I do work on paper – it’s nice to use a mixed media paper because of it’s heft. This paper accepts paint without any curling. Most importantly, I can use my hole punches to create teeny art journals with it. They are so precious and the paper is strong enough to make it work. I also make my own accordion fold journals with this paper. 16. Sakura Gelly Roll White Gel Pens If I had nothing else to make art right now, I’d want liquid acrylics and white gel pens. Dots, patterns, lettering, and line drawings on dark paper – I seem to never tire of this beautiful white ink appearing on the page. For a lot of people, gift giving is hard. Those folks will love you for making their holiday easier. Those who already have a gift or an idea will likely stick to it. When using a direct approach and letting family know what’s on my wish list, I like including things in a range of prices too, that way I’m not suggesting they spend too much. Or, you might think of a more subtle, direct, or funny way to let folks know if they are looking for ideas you’ve got some. Let us know in the comments what methods you use and how it goes, as well as what else is on your wish list. Art books? Juicy watercolors? A gelli plate? Tell us about it in the comments. The product links in this post are affiliate links. 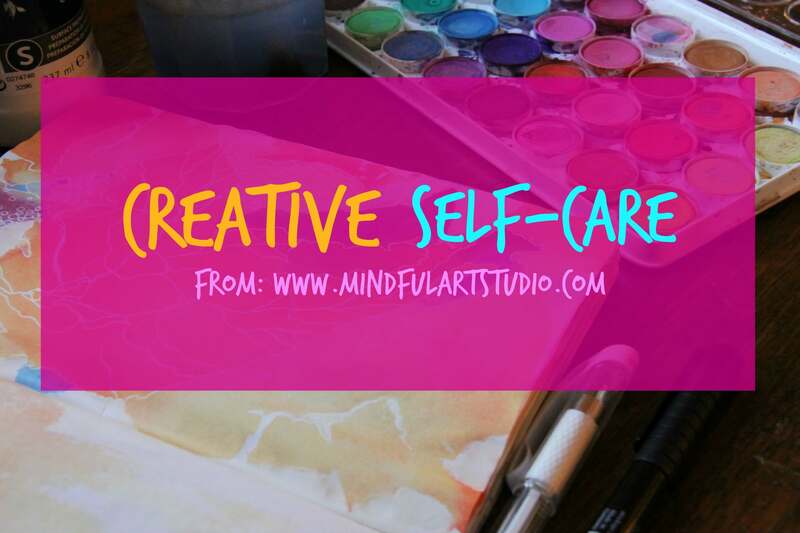 That means that, at no extra cost to you, if you choose to click and purchase something, you will support the work of Mindful Art Studio to empower the artist in all of us. Thanks!